Saxifrage (Saxifraga spp. ): growing, planting, caring. Scientific name : Saxifraga spp. Saxifraga - the saxifrage - is the largest genus in the family Saxifragaceae, with more than 400 species of perennial plants, native to subarctic regions. Most species are small plants with leaves growing close to the ground, often in a rosette. The leaves may be succulent, needle-like or even hairy. The inflorescence or single flower clusters rise above the main plant body on naked stalks, mostly white, but red to yellow in some species. Numerous species and cultivars are cultivated in the ornamental garden as a groundcover, or as a cushion plant in rock gardens. 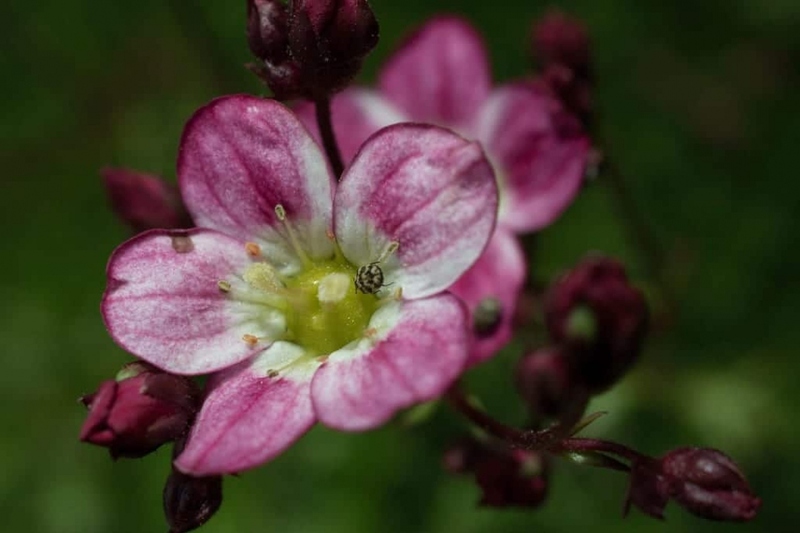 S. × urbium - London pride - is a hybrid between Pyrenean saxifrage (S. umbrosa) and St. Patrick's cabbage (S. spathularis), and commonly grown as an ornamental plant. Some wild species are also used in gardening. Saxifrage is a perennial herbaceous perennial herb. A long bloom from June to September gives small flowers in panicle pink, veined with dark. The semi-evergreen foliage gives a dense tuft, it is a beautiful groundcover for the garden! The saxifrages support a dry and well drained ground: they are perennials of rockery! Dip the clumps in a tray filled with water to moisten them well. Plant them when the water is no longer flowing out of the bucket. Prepare the soil: make holes, leaving a spacing of 20 to 30 cm per foot, and mix the soil with potting soil, sand and peat dust. Place at the bottom of the planting hole an amendment like dried blood or dehydrated horn. Put the plants in there. Cover with soil by tamping gently to avoid air around the roots, then water. Water the first weeks after planting, then during the summer period. Water without excess, once a week if it is very dry, rather in the morning and sparing the leaves. Mulch the saxifrages, it will prevent you from watering and weeding in summer, and - even if they are rather rustic: it will protect the roots of the cold in winter. After flowering, cut back your plant to a compact shape.